The TSN-880 series is the larger of the two newest scope lines from Kowa. We've reviewed scopes before. 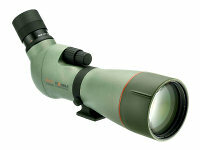 We've reviewed Kowa scopes before. We've never seen anything like this scope before! We received the angled fluorite model TSN-883 ("Prominar", for those of you familiar with Kowa terminology) for review from Kowa along with the TSN-773. These are 88- and 77-mm objective lens size scopes respectively. The TSN-773 will be reviewed in another article. First impressions mean a lot in this game, and the new TSN-883 makes a big one - the view through this optic is breath-taking and unbelievably bright and crisp. In short, we really liked it. Physically, the TSN-883 is a very compact 13.5 inches long (without eyepiece) and weighs in at just over 3 lbs (53.6 oz.). For an objective this size, that weight is impressive - it's actually lighter than some 77-to-82-mm scopes on the market, thanks to its magnesium alloy casing. The body is fully sealed, nitrogen-purged and completely waterproof. So are the eyepieces! The eyepieces lock in place, with a push-button release mechanism. The lens hood pulls straight out, and as always, we recommend using it, if only to protect the objective lens from potential damage by scratching or whatever. Beyond a shallow double groove on the hood, the TSN-883 has no device to enable sighting. When we reviewed the new Kowa scopes, we pulled out the best instruments from other manufacturers that we had in stock. While we won't tell you what the competitor models were (we still have friends at those companies…), we will say right out that the 883 and 773 blew away everything else in their class. By that we mean, these are simply the finest spotting scopes we’ve seen yet. It was a revelation in the field. The degree of detail visible was simply astounding with characteristics of feather wear so clear you would think you were staring at a museum specimen. The image brightness and clarity were riveting. We tried hard to find things wrong with these scopes, and it was really difficult to do. The image stays razor sharp right to the very edge of the field. There is no zone of blurriness, no distortion, no image-bending - nothing. We did note that at the very edge of the field on a bright, high contrast object, there was the slightest hint of color-fringing. So what? The effect is very minor, and very difficult to detect unless you’re looking specifically for it. It’s unlikely to affect a user in any way. Like we said, we had to work hard for this! The colors were absolutely true with no detectable bias. In failing light, the image was remarkably bright at 60x, delivering detail that wasn't even visible in other high end scope models we compared it to. The image quality is so high that it is difficult to write about without sounding like we're gushing. The objective lens on the TSN-883 is pure fluorite crystal. For those of you who care (and you should! ), the lenses are made of environmentally friendly eco-glass and are fully multi-coated with Kowa’s proprietary coatings. Kowa claims 99% or higher light transmission. We don’t have the equipment to quantitate that, but we saw no evidence with which to dispute that claim. The minimum close focus on the TSN-883 is 16.5 feet, which is about average for a modern high-powered scope. If it's closer than that, we recommend using your binoculars! Another distinctive feature of this scope is the dual focusing mechanism. While not unique to the new Kowas, this mechanism was particularly well-executed on these scopes. The mechanism has two knobs in sequence, a larger knob nearer the eyepiece for rapid 'rough' focus, and a smaller knob for finer focus. This scope goes from minimum close focus to infinity in just two full turns of the rough focus knob. The mechanism was very smooth on both. In our field trials, we noted that when focusing, the image never moves, in marked contrast to those scopes that use a helical-wheel focus mechanism, where it is impossible to adjust the focus without causing the image to tremble. Like most scopes nowadays, the TSN-883 can use a selection of different eyepieces. With Kowa having just released a series of new eyepieces to fit their old scope lines, this subject is foremost in many Kowa users' minds. Through the use of adaptors, older Kowa eyepieces can be used on both the 880 and 770 scope lines. We received the 25x long eye relief, the 30x wide-angle and 20-60x zoom eyepieces, and were very impressed with them. They all have a very respectable field of view with the 20-60x zoom eyepiece coming in at 115 feet (20x) at 1000 yards, the 30x wide-angle with 125 feet at 1000 yards, and the 25x long eye relief eyepiece with 110 feet at 1000 yards. These eyepieces offer 17-16.5 mm of eye relief for the zoom, and 20 and 32 mm for the 30x wide-angle and 25x long eye relief eyepieces respectively. The eyepieces also feature twist-up eyecups with detents for the zoom and 30x wide-angle eyepieces. The 25x long eye relief eyepiece has a pliable rubber cup. The 30x wide-angle eyepiece has five independent settings for the eyecup (the zoom lens only has four). The eyepieces even come in individual drawstring leather protective pouches. We did find one slight problem with these eyepieces: the eyecup has an annoying tendency to come unscrewed when you're trying to adjust it. This arises from the fact that the digiscoping adaptor is designed to fit in the place occupied by the eyecup. Kowa has consistently been one of the most accommodating manufacturers in terms of how their scopes adapt for digiscoping. The TSN-883 continues this, at an additional cost. The adaptor must be purchased separately. The base component of the digiscoping adaptors is the TSN-DA10, which attaches to the eyepieces (instead of the scope body) by screwing onto the threads for the eyecup (see above). All previous Kowa digiscoping attachments will fit the DA10. Like the other accessories, the DA10 was not available at the time of this review, so we cannot discuss its properties. The tripod mounting foot has a removable bushing that allows the user to select between 1/4-20" and 3/8" mounting screws, a refinement we've not seen before. This property gives the user more choices among tripods. The tripod mounting foot sits on a rotating collar, held in place by a set-screw. When loosened, the scope rotates freely in either direction, with 6 click-stops pre-set in the most logical positions for field use. The products are so new that none of the accessories are available for review yet, so we can't say much about the case (these are expected to ship in January, 2007). We hope the case is nice because there is no armoring on the scope body, and you will want to protect this investment. Which segues neatly into a discussion of price… If you want one of these babies, be prepared to lay out $2,450.00 for the TSN-883 body and $600.00 for the 20-60x zoom eyepiece, and $400.00 for the 30x wide-angle eyepiece, or $400.00 for the 25x long eye relief eyepiece. All we can say is the price is in accord with the performance.